This page provides links to online Block publications, and information on selected other publications (e.g., some books). More comprehensive lists are linked immediately below. Defending the Undefendable: The Pimp, Prostitute, Scab, Slumlord, Libeler, Moneylender, and Other Scapegoats in the Rogue’s Gallery of American Society (New York: Fleet Press, first printing 1976, second printing 1980, third printing 1985; New York: Fox and Wilkes, fourth printing, 1991). Labor Economics from a Free Market Perspective: Employing the Unemployable. Toh Tuck Link, Singapore: World Scientific Publishing. 2008. Some books available in Large Print format here. Block, Walter. 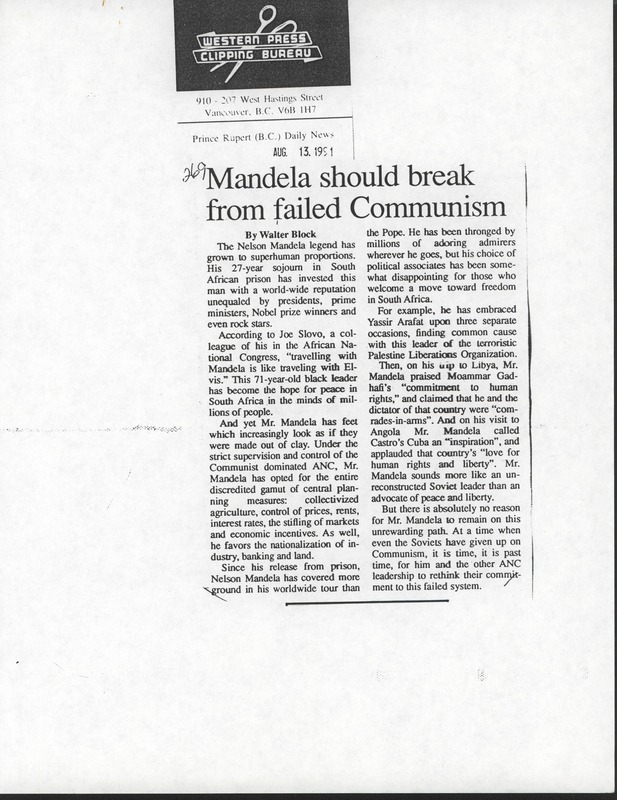 “Mandela Should Break From Failed Communism”. Prince Rupert Daily News. Aug 13, 1991. Block, Walter. “Capitalism has Supplanted Socialism”. Dollars and Sense. The Fraser Institute. Sept 26, 1990. Block, Walter. Sweden is no Model of Socialism Either. British Colombia Report. April 23, 1990. Block, Walter. 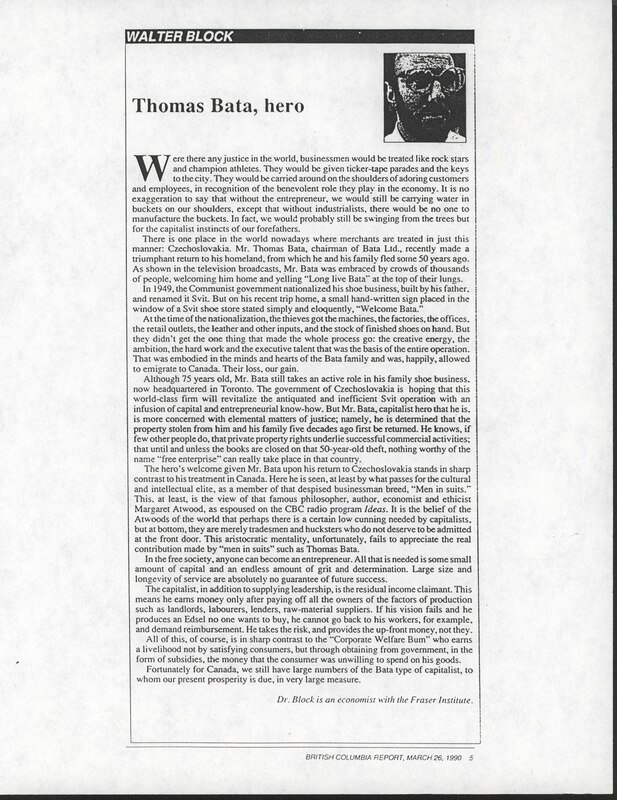 Thomas Bata, Hero. British Colombia Report. March 26, 1990. Block, Walter, Is There a Ph.D. Glut in Economics in Academia? Romanian Economic and Business Review, Vol. 5, No. 1, pp. 9-26;reprinted in Economics, Management, and Financial Markets, Vol. 5, No. 1, 2010. Block, Walter. “Van Dun on Freedom and Property: A Critique” Libertarian Papers; Vol. 2, No. 4. 2010. Block, Walter. “Reply to Frank van Dun’s ‘Natural Law and the Jurisprudence of Freedom’” Journal of Libertarian Studies. Vol. 18, No. 2, Spring 2004. pp. 65-72. Block, Walter and Llewellyn H. Rockwell, eds. Man, Economy and Liberty: Essays in Honor of Murray N. Rothbard, Auburn University, The Mises Institute 1988. Block, Walter, The Discounted Marginal Value Product – Marginal Value Product Controversy: A Note Review of Austrian Economics, Vol. IV, 1990, pp. 199-207. Block, Walter, Coase and Demsetz on Private Property Rights The Journal of Libertarian Studies: An Interdisciplinary Review, Vol. I, No. 2, Spring 1977, pp. 111-115. Block, Walter. 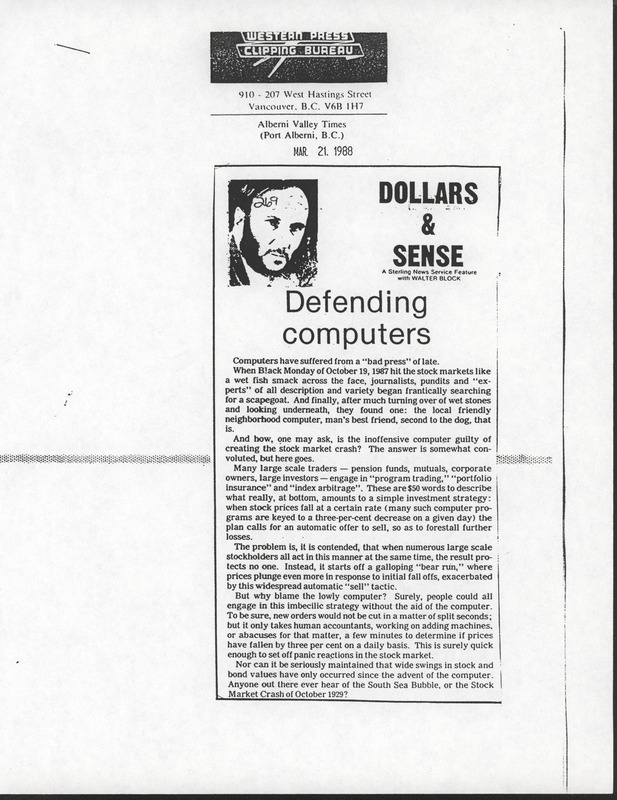 Defending Computers. Alberni Valley Times. March 21, 1988. Block. Walter. “The U.S. Economy and the Next Presidential Election.” Interview with Tehran Chamber of Commerce and Industries and Mines. April 14, 2012. Block, Walter, 7/8/04, Listen, Kerry! Barnett, William II and Walter Block. 2009. “Investment and Consumption: A Critique of Rothbard’s Claim that there can be no such thing as Governmental ‘Investment‘” Journal of Public Finance and Public Choice. 27 (2-3): 183-188. Barnett, William and Walter Block. Is There a Market for Money, or Are There Markets for Money? There Ain’t no Such Thing as the Supply of or Demand for Money. Laissez-Faire. Block, Walter, The Negative Rate of Interest: Toward a Taxonomic Critique The Journal of Libertarian Studies: An Interdisciplinary Review, Vol. II, No. 2, Summer 1978, pp. 121-124. Block, Walter. The Ugly Canadian. May 9, 1990. Block, Walter. “My Daughter, and Tibet, China and the Neocons” March 31, 2008. Block, Walter. “Ron Paul and Matching Funds,” October 1, 2007. Block, Walter. “Privatization Would End Government Ineptness.” The Maroon. March 3, 2006. p. 5. Block, Walter. 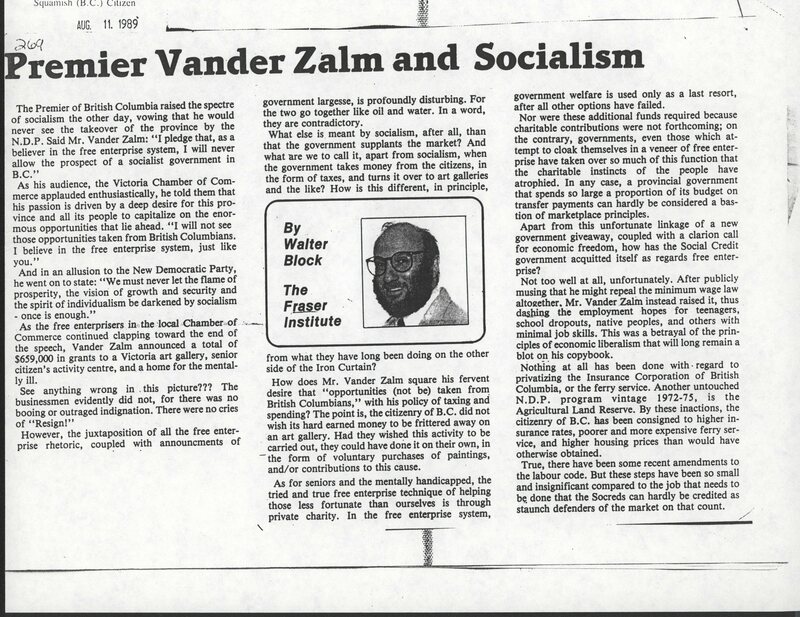 Premier Vander Zalm and Socialism. Squamish Citizen. Aug 11, 1989. Block, Walter. 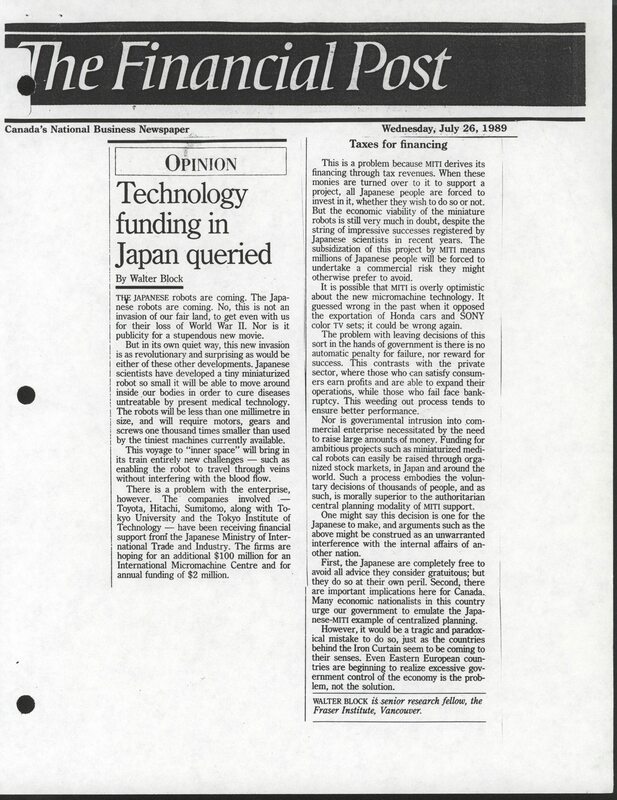 Technology Funding in Japan Queried. 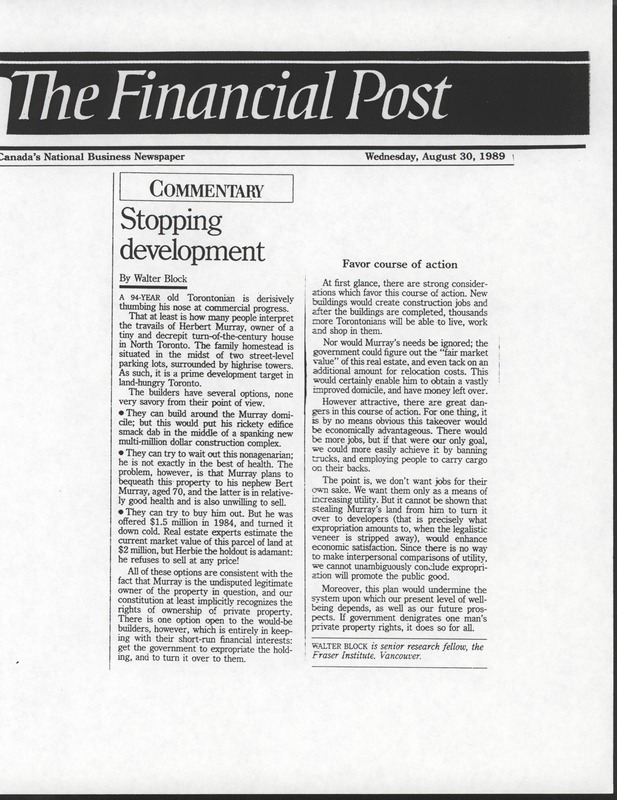 The Financial Post, July 26, 1989. Block, Walter, David Lorch, Bobby Midkiff, and Keith Reed. Let’s End, Not Mend, Social Security. Institute of Economic Affairs. 2002. Block, Walter. “Leaving Iraq.” July 1, 2008. Vuk, Vedran and Walter Block. “Victory in Iraq.” January 21, 2008. Block, Walter. “My Iranian Friend Houshang Memarzedeh.” February 6, 2007. Block, Walter and Chris Arakaky. “Taking Government Money for Grad School?,” May 23, 2008. Block, Walter. “Striking Back at the Forces of Barbarism and Political Correctness.” October 28, 2009. Block, Walter. “The Case for Enrolling at Loyola University New Orleans.” October 27, 2009. Block, Walter. 2009. “University has great room for improvement.” The Loyola Maroon. April 24, 2009. Block, Walter. “On the Attack: Racists and Sexists at Loyola University New Orleans and of Loyola University in Maryland, Beware.” October 15, 2009. Block, Walter. “How I Offended the Diversitarians.” April 20, 2009. Block, Walter. “An Open Letter to the Members of the Diversity Task Force of Loyola University New Orleans,” March 23, 2009. Block, Walter. “Enough with the ‘Diversity.’” March 9, 2009. Block, Walter. “Diversity Task Force Draws Professor’s Ire.” The Maroon. March 6, 2009. Block, Walter. “Sue for Libel?” December 29, 2008. Block, Walter. 2008. “J’Accuse (Walter Block seeks Justice from the Affirmative Action Diversity Task Force, Loyola University New Orleans; Good Luck! )” December 23, 2008. Block, Walter. “Battling Political Correctness, and Beating It: The Battle Over Political Correctness Continues.” December 16, 2008. Block, Walter. “No Justice, No Peace: No Justice at Loyola.” December 11, 2008. Block, Walter. “Block to Fok.” December 8, 2008. Block, Walter. “Further Developments on the Issue of Social Justice in Baltimore” December 6, 2008. Block, Walter. “More Controversy Over Female-Male Pay Gap,” December 5, 2008. Block, Walter. “Afraid to Debate.” December 3, 2008. Block, Walter. “The Idea Police vs. Walter Block: A (Not So) Funny Thing Happened To Me in Baltimore.” November 18, 2008. Block, Walter. Is the Market Racist and Sexist: The Wage Gap and the Glass Ceiling. July 11, 2005. Ragan, Trey and Walter Block. “’Wage gap’ due to differentiation among sexes’ roles,” Loyola Maroon, Friday, April 11, 2003. Block, Walter. “Are Unions Criminal Gangs?” Global Virtue Ethics Review, Vol. 6. No. 1, pp. 28-49. 2010. Block, Walter. “Commentaries on Gordon and on Bylund (on their reviews of Labor Economics from a Free Market Perspective: Employing the Unemployable).” Journal Etica e Politica / Ethics & Politics, Vol. X, No. 2, pp. 248-252. 2008. Block, Walter. “The Evil of Unions: In the Public as well as the Private Sector.” Sept 14, 2005. Block, Walter. “The Yellow Dog Contract: Bring It Back!” September 5, 2005. Block, Walter, 1/1/04, Is There a Right to Unionize? Barnett, William and Walter Block, “The $4.25/Hour Syndrome” The Chalcedon Report, May 1997, No. 382, pp. 17-19. Block, Walter. 8/11/84. Work sharing won’t bring solution to unemployment The Financial Post. (Alternate copy here). Block, Walter. 1988. 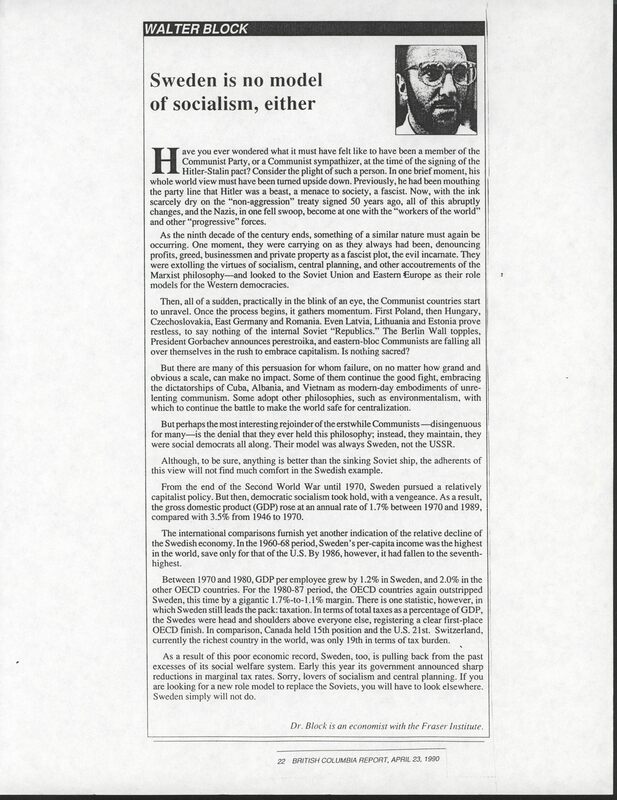 How the Market Creates Jobs and How the Government Destroys Them The Free Market, May, translated into Spanish as “El mercado crea trabajos, el gobierno los destruye” in El Siglo, Dominican Republic, 12 March 1991, p. 8B; also in Murray N. Rothbard: Giant of Liberty (with Llewellyn Rockwell), Privatize the Roads, The Case for a Free Market in Body Parts, Essays in the Economics of Liberty: The Free Market Reader, Llewellyn Rockwell, ed., California: The Ludwig von Mises Institute, pp. 65-70, 195-199, 266-272. Sohr, Kevin and Walter Block. “Minimum Wage,” Freeman, Vol. 47, No. 11, November 1997, pp. 681-682. Block, Walter and Roy Whitehead. The Boy Scouts, Freedom of Association and the Right to Discriminate: A Legal, Philosophical and Economic Analysis. Okla. City U. L. Rev. 851. 2004. Block, Walter. Discrimination Helps the Under-Privileged. Economic Affairs. July 1982. Block, Walter, A Free Market in Kidneys The Freeman Ideas on Liberty, August, p. 308; 8/25, Bensalem News. Block, Walter. “Landsburg on Crime.” October 19, 2005. Block, Walter. “Reply to Matt Mortellaro on “Block’s Paradox”: Causation, Responsibility, Libertarian Law, Entrapment, Threats and Blackmail,” Libertarian Papers. 2009. Block, Walter, Toward a Libertarian Theory of Blackmail Journal of Libertarian Studies, Vol. 15, No. 2, Winter 2001, pp. 55-88. Block, Walter. “Are Alienability and the Apriori of Argument Logically Incompatible?” Dialogue, Vol. 1, No. 1. 2004. Block, Walter. Drugs and the Olympics. 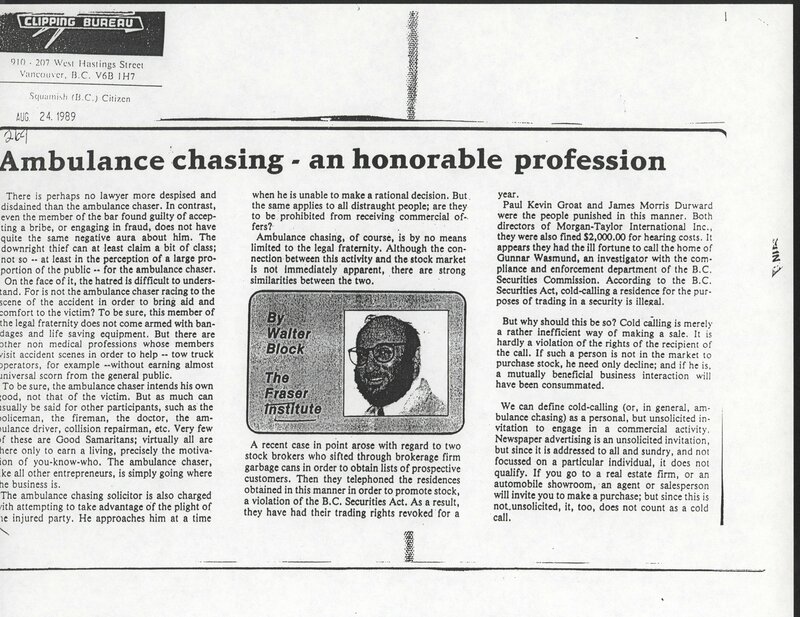 Block, Walter, 9/27/01, What do Boxing and Business Schools Have in Common? Block, Walter. CBC Privatization Called For. Richmond Review. July 21, 1989. Block, Walter. Franchising Deserves its Place. The Financial Post. July 8, 1988. Block, Walter. 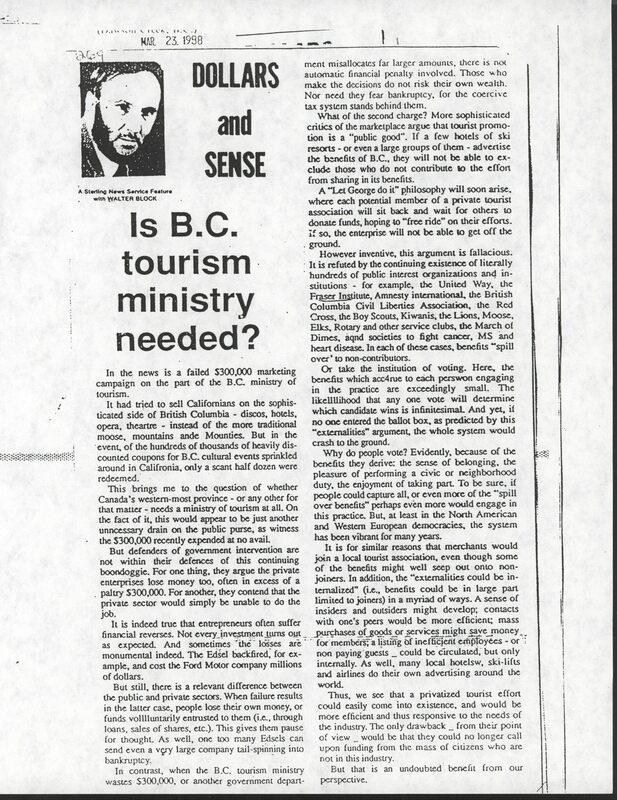 Is BC Tourism Ministry Needed? Dollars and Sense. The Fraser Institute. March 23, 1988. Block, Walter. Convention Centers. Trail (BC) Daily Times. 29 May 1985. Block, Walter, Total Repeal of Anti-trust Legislation: A Critique of Bork, Brozen and Posner, ; Review of Austrian Economics, Vol. 8, No. 1, 1994, pp. 31-64. Block, Walter, Austrian Monopoly Theory — a Critique The Journal of Libertarian Studies: An Interdisciplinary Review, Vol. I, No. 4, Fall 1977, pp. 271-279. Block, Walter. 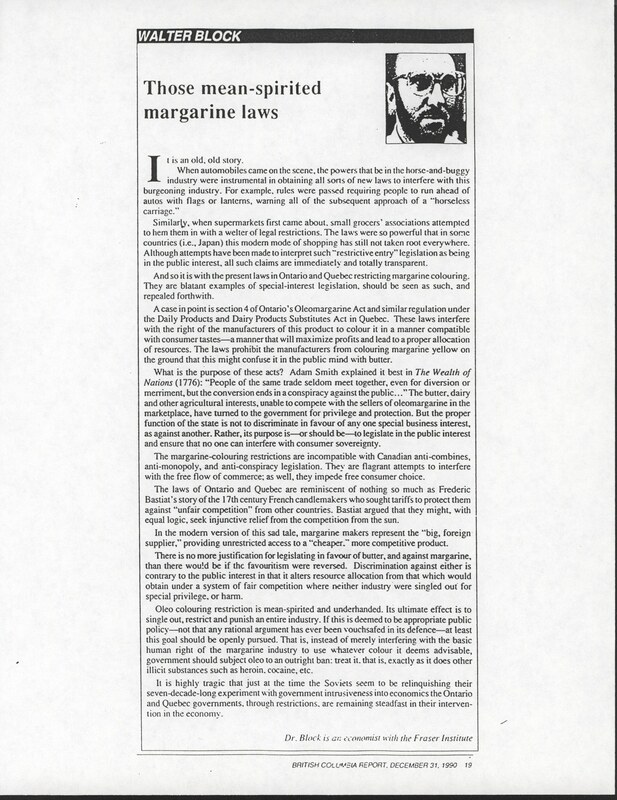 Those Mean-Spirited Margarine Laws. British Colombia Report. Dec 31, 1990. Block, Walter. No Reason to Sneer at Professional Services. The Financial Post. Feb 13, 1990. Block, Walter. Ambulance Chasing – An Honorable Profession. Squamish Citizen, Aug 24, 1989. Reprinted as Why Get Mad About Ambulance Chasers. Insights. Block, Walter. The Digital Divide is not a Problem in Need of Rectifying. Journal of Business Ethics. 53: 393-406, 2004. Block, Walter. Maritimes Could Grow Economically. Daily Townsman. Dec 31, 1990. Gwartney, James, Robert Lawson and Walter Block. Economic Freedom of the World, 1975-1995 Vancouver, B.C. 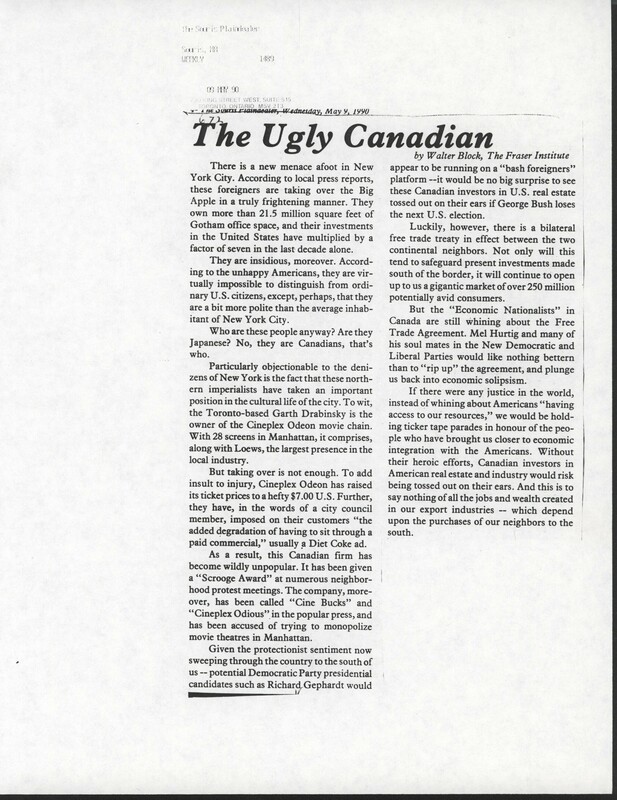 Canada: The Fraser Institute, 1996. 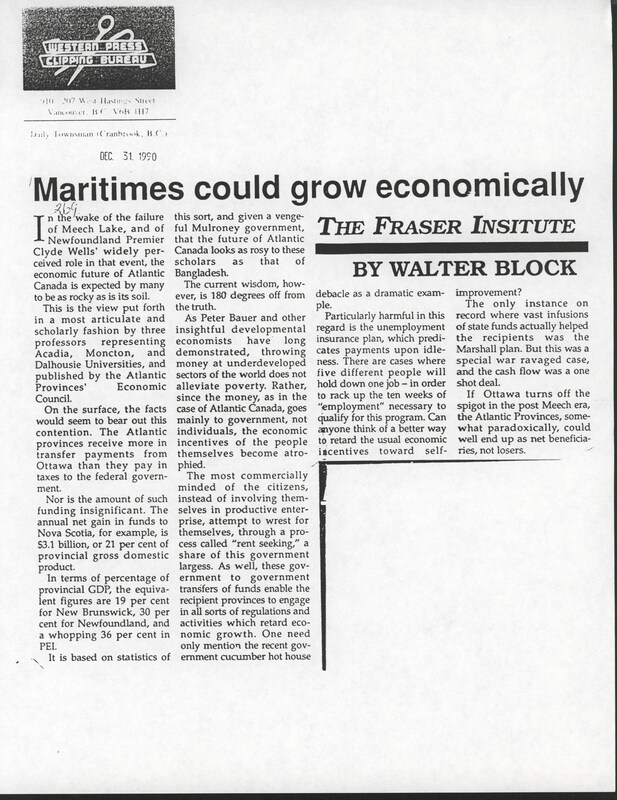 Block, Walter, Economic Freedom: Toward a Theory of Measurement, Vancouver: The Fraser Institute, ed. 1991. Block, Walter. Stopping Development. The Financial Post. Aug 30, 1989. Block, Walter. 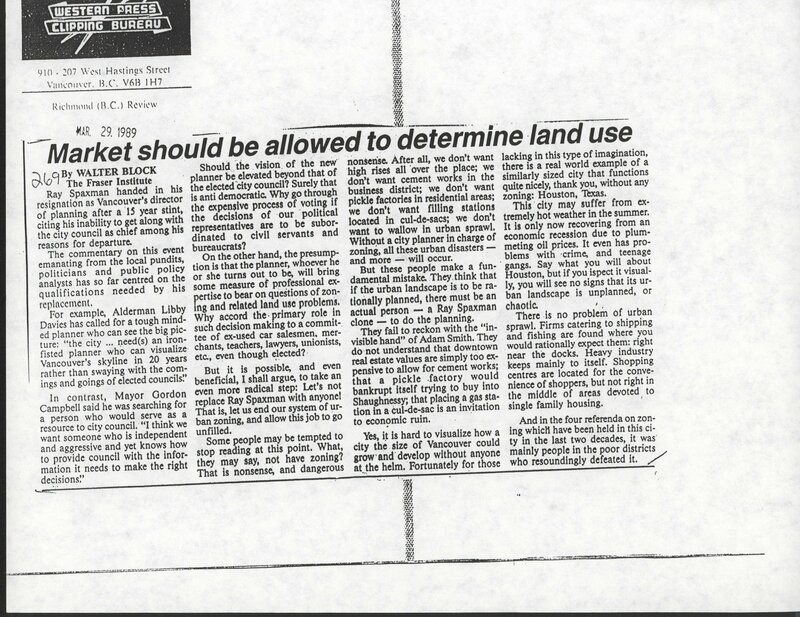 Market Should be Allowed to Determine Land Use. Richmond Review. March 29, 1989. Block, Walter. Synthetic Biology Does Not Need a Synthetic Bioethics: Give Me That Old Time (Libertarian) Ethics. Ethics, Policy, and Environment. 15:1, 33-36. March 2012. Downloadable copy here. Block, Walter and Alexander M. Schaefer. Free-Market Energy. Energy and Environment. Vol 23, No 4. 2012. Block, Walter. Memo to the NTU. August 22, 2007. Block, Walter, A Free-Market Environmentalist Approach to Genetically Modified Foods Santa Clara Journal of International Law, Vol. III, 2005, Issue No. 2. Block, Walter E. “You are a Rotten Kid (Rent Control and Libertarianism),” February 27, 2010. Block, Walter. “Preface,” Keith Lehrer, The Landlord as Scapegoat, Vancouver: The Fraser Institute, pp. vii-xvi, 1991. Block, Walter. “A Future of Private Roads and Highways.” April 17, 2009. Block, Walter, Public Goods and Externalities: The Case of Roads The Journal of Libertarian Studies: An Interdisciplinary Review, Vol. VII, No. 1, Spring 1983, pp. 1-34. Block, Walter, Congestion and Road Pricing The Journal of Libertarian Studies: An Interdisciplinary Review, Vol. IV, No. 3, Fall 1980, pp. 299-330. Block, Walter. “Libertarian Basics.” November 30, 2009. Block, Walter. “Block Replies To Readers, Part II.” December 1, 2008. Block, Walter. “Reflections on Attending the 2008 Libertarian Party Convention in Denver,” May 31, 2008. Block, Walter. “Shills for World Government: Doctors, Engineers, Journalists, etc., Without Borders,” May 24, 2008. Block, Walter. “Response to Roderick Long on Ron Paul and Randy Barnett.” March 16, 2008. Block, Walter. “Those Cartoons: a Libertarian Analysis.” February, 21, 2006. Block, Walter. Multiculturalism in Canada. Dollars and Sense. The Fraser Institute. Nov 2, 1990. Ianelli, James and Walter Block, The Moral Resonance of Catholic Globalization Perspectives, Humanomics, Vol. 23, No.3, 2009, pp. 189-196. Block, Walter. “Preface,” James A. Schall, S.J., Religion, Wealth and Poverty, Vancouver: The Fraser Institute, pp. ix-xiii, 1990. Block, Walter. Book review of Hardin, Russell (2009) How Do You Know? The Economics of Ordinary Knowledge. Princeton, NJ: Princeton University Press. Block, Walter. Book review of Pipes, Richard, Property and Freedom: The Story of how Through the Centuries Private Ownership has Promoted Liberty and the Rule of Law, New York: Knopf, 2000, in The Quarterly Journal of Austrian Economics, Vol. 5, No. 1, Spring 2002. pp. 97-101. Book Note (review of Hans-Hermann Hoppe), Democracy: The God that Failed: The Economics and Politics of Monarchy, Democracy, and Natural Order. Block, Walter. The Political Syringe. Feb 4, 2013. Block, Walter. Work Sharing Won’t Bring Solution to Unemployment. 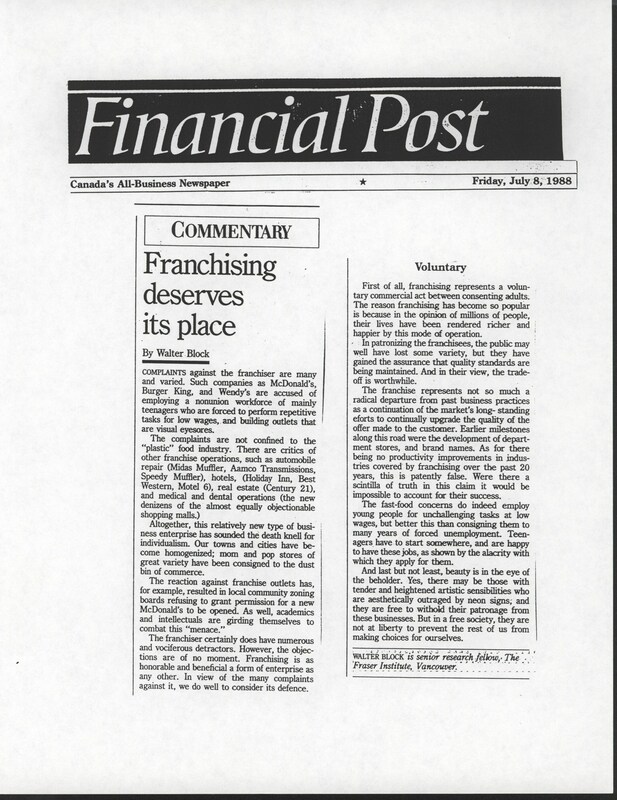 The Financial Post, August 1984. Block, Walter and Paul McCormick. The Minimum Wage: Does it Really Help Workers? Southern Connecticut University Business Journal, Vol. 15, No. 2, Fall/Spring 2000, pp. 77-80. Block, Walter, Zoe Greene, Sally Henry, and Coby Nathason. The Negative Impacts of Minimum Wage and Anti Sweatshop Legislation. Humanomics, Vol. 23, No. 2, 2007, pp. 83-92. Block, Walter. Labor Relations, Unions, and Collective Bargaining: A Political Economic Analysis. Journal of Social, Political and Economic Studies, Vol. 16, No. 4, Winter 1991, pp. 477-507. Block, Walter and Jason Evans. Labor Union Policies: Gains or Pains? Cross Cultural Management, Vol. 9, No. 1, pp. 71-79. Block, Walter. Commentaries on Gordon and on Bylund. Journal Etica e Politica, Vol. X, No. 2, 2008, pp. 248-252. Block, Walter. Are Unions Criminal Gangs? Global Virtue Ethics Review, Vol. 6, No. 1, 2010, pp. 28-49. Block, Walter. Synthetic Biology Does Not Need a Synthetic Bioethics: Give Me That Old Time (Libertarian) Ethics. Ethics, Policy & Environment, Vol. 15, No. 1, 2012. Block, Walter and Michael Walker. On Employment Equity. The Fraser Institute, Focus, No. 17, 1985. Anderson, Gary M. and Walter Block. Procrastination, Obedience, and Public Policy: The Irrelevance of Salience. American Journal of Economics and Sociology, Vol. 54, No. 2, April 1995, pp. 201-215. Block, Walter and Robert Murphy. The Economics of the Very Long Run. Homo Oeconomicus, Vol. 19, No. 4, 2003. pp. 507-517. Block, Walter. On the Woman’s Liberation Movement or, the Male Chauvinist Pig as Hero. The Libertarian Forum, Vol. 7, No. 9, September 1975, pp. 5-8. Block, Walter. Free Enterprise and Poverty: Cause or Cure? Dialog, No. 1, 2007. pp. 67-81. Block, Walter and Roy Whitehead. Mandatory Student Fees: Forcing Some to Pay for the Free Speech of Others. Whittier Law Review, Vol. 20, No. 4, 1999, pp. 759-781. Block, Walter and Andrew Young. Enterprising Education: Doing Away with the Public School System. International Journal of Value Based Management, Vol. 12, No. 3, 1999, 195-207. Block, Walter and Roy Whitehead. Direct Payment of State Scholarship Funds to Church-Related Colleges the Constitution and Title VI. Brigham Young University Journal of Public Law, Vol. 14, No. 2, 2000, pp. 191-207. Block, Walter, Clint Johnson, and Thomas Oxner. Notes on Health Care Financing and Free Markets. Journal of Accounting, Ethics, and Public Policy, Vol. 1, No. 3, Summer 1998, pp. 488-502. Block, Walter. Socialized Medicine is the Problem. 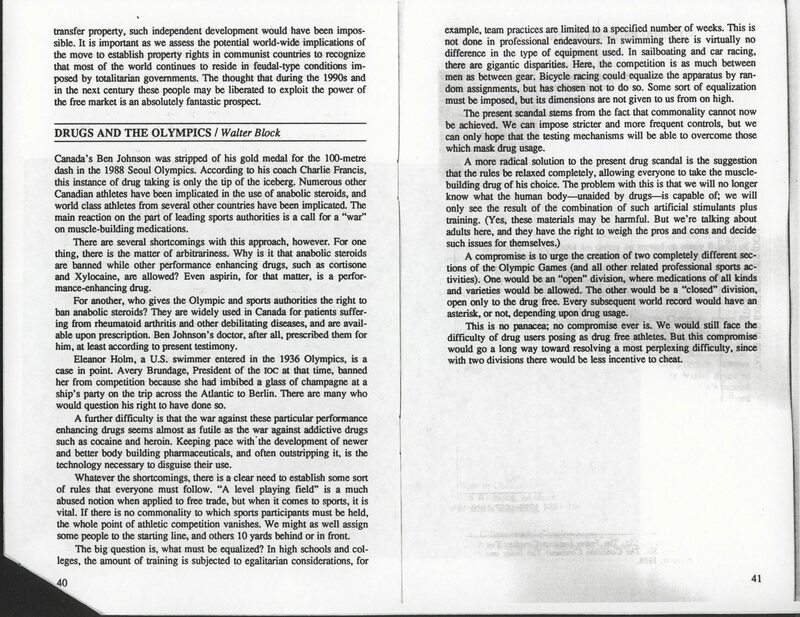 Ideas on Liberty, December 2001. Block, Walter. Is There a Human Right to Medical Insurance? Business & Professional Ethics Journal, Vol. 27, 2007. Block, Walter. Against the Volunteer Military. 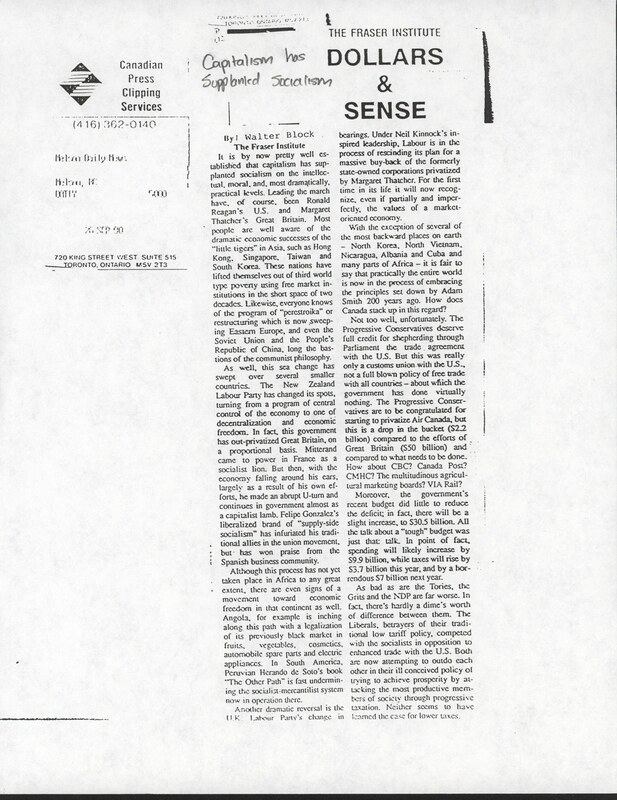 The Libertarian Forum, August 1969, pp. 4. Block, Walter. Social Welfare in Canada: The Case for Selectivity. 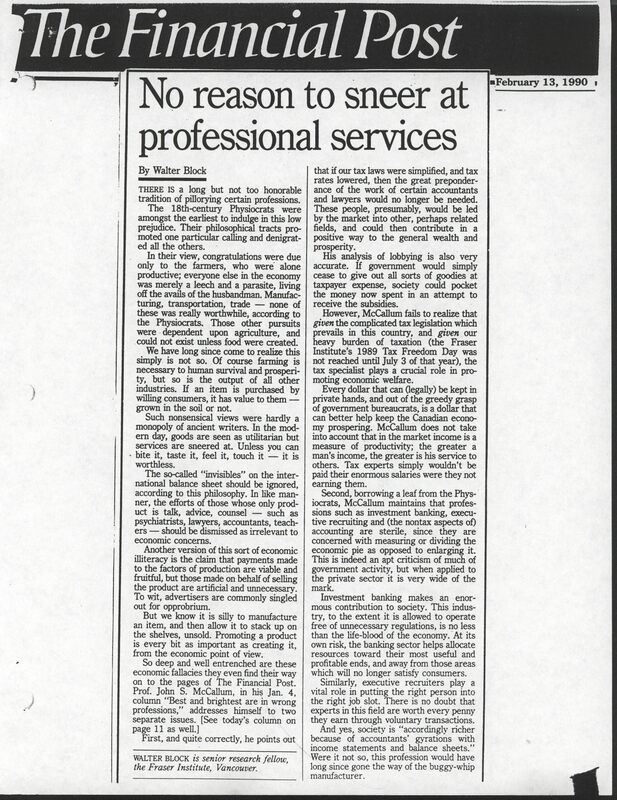 Canadian Social Work Review, 1983, pp. 25-32. Block, Walter. Analyzing the Welfare System. School of Social Work, University Victoria, Victoria, B.C., reprinted in Vital Speeches of the Day, Vol LV, No. 11, March 1989. Block, Walter. The Moral Dimensions of Poverty, Entitlements and Theft. The Journal of Markets and Morality, Vol. 4, No. 1, 2001, pp. 83-93. Block, Walter, David Lorch, Bobby Midkiff, and Keith Reed. Let’s End, Not Mend, Social Security. Institute of Economic Affairs, 2002. Block, Walter. The Justification of Taxation in the Public Finance Literature: An Unorthodox View. Journal of Public Finance and Public Choice, No. 3, Fall 1989, pp. 141-158. Block, Walter. Comment on McCready and Maloney on Wealth Taxation. Canadian Public Administration, Vol. 35, No. 4, Winter 1992, pp. 542-548. Block, Walter. Public Finance Texts Cannot Justify Government Taxation: A Critique of Musgrave & Bird; McCready; and Wolf. Canadian Public Administration, Vol. 36, No. 2, Fall 1993, pp. 225 – 262. Block, Walter. Reply to Hill and Rushton on Public Finance. Canadian Public Administration, Vol. 38, No. 3, Fall 1995. pp. 485-486. Block, Walter. Taxes and the Structure of Production. Journal of Public Finance and Public Choice, Vol. 17, Nos. 2-3, 1998, pp. 145-159. Block, Walter. Technology Funding in Japan Queried. The Financial Post, July 1989. Block, Walter. Premier Vander Zalm and Socialism. 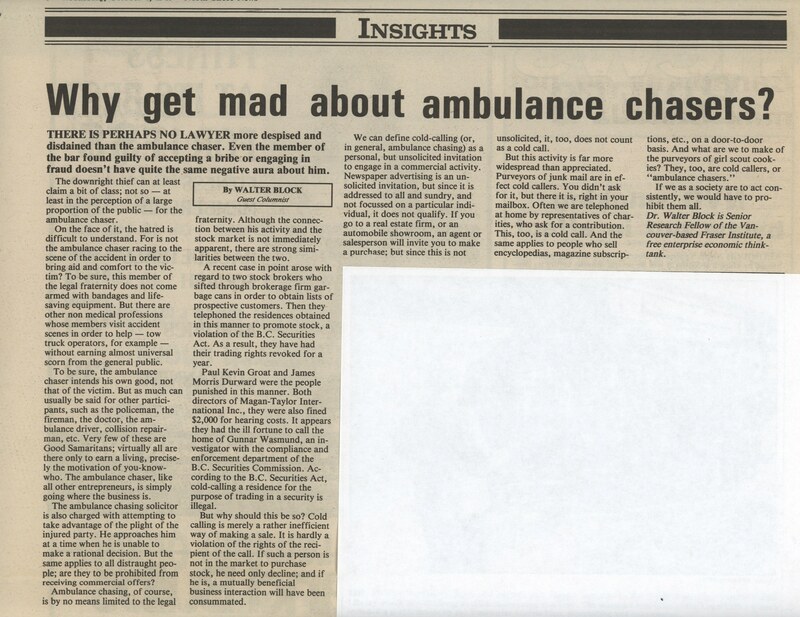 Squamish Citizen, August 1989. Block, Walter. All Government is Excessive: A Rejoinder to ‘In Defense of Excessive Government’ by Dwight Lee. Journal of Libertarian Studies, Vol. 16, No. 3, 2002, pp. 35-82. Block, Walter. The Libertarian Minimal State? A Critique of the Views of Nozick, Levin and Rand. Journal of Ayn Rand Studies, Vol. 4, no. 1, 2002, pp. 141-160. Block, Walter. Decentralizations, Subsidiarity, Rodney King and State Deification. European Journal of Law and Economics, Vol. 16, No. 2, November 2003, pp. 139-147. Block, Walter. Radical Libertarianism: Applying Libertarian Principles to Dealing with the Unjust Governments, Parts I & II. Loyola University of New Orleans, Fall 2004 & Spring 2006. Block, Walter. Anarchism and Minarchism; No Rapprochement Possible: Reply to Tibor Machan. Journal of Libertarian Studies, Vol. 21, No. 1, Spring 2007, pp. 91-99. Alston, Wilton D. and Walter Block. Reparations, Once Again. Human Rights Review, Vol. 9, No. 3, September 2007, pp. 379-392. Block, Walter. Plumb Line Libertarianism: A Critique of Hoppe. Reason Papers, Vol. 29, Fall 2007, pp. 151-163. Block, Walter. Libertarian Punishment Theory: Working For, and Donating to, the State. Libertarian Papers, Vol. 1, 2009. Block, Walter, William Kordsmeier, and Joseph Horton. The Failure of Public Finance. Journal of Accounting, Ethics, and Public Policy, Vol. 2, No. 1, Winter 1999, pp. 42-69. Block, Walter. The Gold Standard: A Critique of Friedman, Mundell, Hayek, and Greenspan. Managerial Finance, Vol. 25, No. 5, 1999, pp. 15-33. Block, Walter. A Libertarian Case for Free Immigration. Journal of Libertarian Studies: An Interdisciplinary Review, Vol. 13, No. 2, Summer 1998, pp. 167-186. Block, Walter and Gene Callahan. Is There a Right to Immigration? A Libertarian Perspective. Human Rights Review, Vol. 5, No. 1, October-December 2003, pp. 46-71. Block, Walter and Anthony Gregory. On Immigration: Reply to Hoppe. Journal of Libertarian Studies, Vol. 21, No. 3, Fall 2007, pp. 25-42. Block, Walter, Yeoman Yoon and Robert McGee. Do We Need Protectionism? Asian Economic Review, Vol. 39, 1997. Block, Walter. Optimal Export Policy for a New Product Monopoly. Cross Cultural Management, Vol. 6, No. 2, 1999, p. 29-32. Anderson, James, Dreuil Emile, Walter Block, and Michael Saliba. The Trade Gap: The Fallacy of Anti World Trade Sentiment. Journal of Business Ethics, Vol. 45, No. 3, July 2003, pp. 269-281. Block, Walter, Hans-Hermann Hoppe and Guido Hulsmann. Against Fiduciary Media. Quarterly Journal of Austrian Economics, Vol. 1, No. 1, pp. 19-50. Barnett, William II and Walter Block. On the Optimum Quantity of Money. Quarterly Journal of Austrian Economics, Vol. 7, No. 1, 2004, pp. 39-52. Barnett, William II and Walter Block. In Defense of Fiduciary Media – A Comment, or, What’s Going Wrong with “Clown” or Play Money? Quarterly Journal of Austrian Economics, VOl. 8, No. 2, Summer 2005, pp. 55-69. Block, Walter. Ayn Rand and Austrian Economics: Two Peas in a Pod. Journal of Ayn Rand Studies – Vol. 6, No. 2, Spring 2006, pp. 259-269. Block, Walter. The Negative Rate of Interest: Toward a Taxonomic Critique. The Journal of Libertarian Studies: An Interdisciplinary Review, Vol. 2, No. 2, Summer 1978, pp. 121-124. Barnett, William II and Walter Block. Money: Capital Good, Consumers’ Good, or (Media of) Exchange Good? Review of Austrian Economics, 2005, pp. 179-194. Barnett, William II and Walter Block. Is There a Market for Money, or Are There Markets for Money? There Ain’t No Such Thing as the Supply of or Demand for Money. Laissez-Faire. Barnett, William II and Walter Block. On Exchange, Monetary Credit Transactions, Barter, Time Preference, Interest Rates, and Productivity. Ethics a& Politics, Vol. 8, No. 2, pp. 116-126. Block, Walter and Kenneth Garschina. Hayek, Business Cycles and Fractional Reserve Banking: Continuing the De-Homogenization Process. Review of Austrian Economics, Vol. 9, No. 1, 1996, pp. 77-94. Barnett, William II and Walter Block. Professor Tullock on Austrian Business Cycle Theory. Advances, in Austrian Economics, Vol. 8, pp. 431-443. Block, Walter. Yes, We Have No Chaff: A Reply to Wagner’s ‘Austrian Business Cycle Theory: Saving the Wheat While Discarding the Chaff. Quarterly Journal of Austrian Economics, Vol. 4, No. 1, Spring 2001, pp. 63-73. Barnett, William II and Walter Block. Tyler Cowen on Austrian Business Cycle Theory: A Critique. New Perspectives on Political Economy, Vol. 2, No. 2, 2006, pp. 26-84. Barnett, William II and Walter Block. Some Thoughts on Price Deflation. New Perspectives on Political Economy, Vol. 2, No. 1, June 2006, pp. 1-12. Barnett, William II and Walter Block. On Laidler on Austrian Business Cycle Theory. Procesos de Mercado: Revista Europea De Economia Politica, Vol. 3, No. 2, Fall 2006, pp. 39-141. Barnett, William II and Walter Block. On Hayekian Triangles. Review of Austrian Economics, Vol. 20, No. 1, March 2007, pp. 43-61. Barnett, William II and Walter Block. On Hummel on Austrian Bussiness Cycle Theory. Reason Papers, V0l. 30, Fall 2008, pp. 59-90. Barnett, William II, Robert P. Murphy, and Walter Block. Testing Austrian Business Cycle Theory? A Rejoinder to Andrew T. Young. Journal of Business and Economic Perspectives, Vol. 35, No. 2, Fall/Winter, pp. 73-86. Barnett, William II and Walter Block. Financial Intermediaries, the Intertemporal-Carry Trade, and Austrian Business Cycles OR Crash and Carry: Can Fraudulent Time Deposits Lead to an Austrian Business Cycle? Yes. Journal Etica e Politica/Ethics & Politics, Vol. 11, No. 1, 2009, pp. 455-469. Barnett, William II and Walter Block. Saving and Investment: A Praxeological Approach. New Perspectives on Political Economy, Vol. 3, No. 2, 2007, pp. 129-138. Block, Walter and Tom DiLorenzo. Is Voluntary Government Possible? A Critique of Constitutional Economics. Journal of Institutional and Theoretical Economics, Vol. 156, No. 4, December 2000, pp. 567-582. Block, Walter and Tom DiLorenzo. The Calculus of Consent Revisited. Public Finance and Management, Vol. 1, No. 3. Block, Walter and Tom DiLorenzo. Constitutional Economics and the Calculus of Consent. The Journal of Libertarian Studies, Vol. 15, No. 3, Summer 2001, pp. 37-56. Block, Walter. Defending Computers. 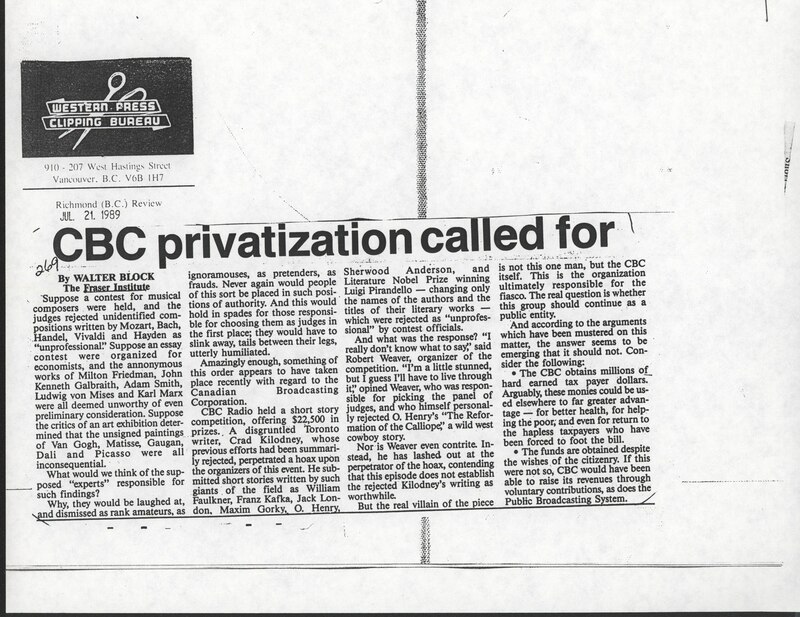 Alberni Valley Times, March 1988. Block, Walter. Government and Market: A Critique of Professor James Buchanan’s “What Should Economics Do?” Corporate Ownership & Control, Vol. 3, No. 1, Fall 2005. Block, Walter. Coase and Demsetz on Private Property Rights. The Journal of Libertarian Studies: An Interdisciplinary Review, Vol. 1, No. 2, Spring 1977, pp. 111-115. Block, Walter. Ethics, Efficiency, Coasean Property Rights and Psychic Income: A Reply to Demsetz. Review of Austrian Economics, Vol. 8, No. 2, 1995, pp. 61-125. Block, Walter. O.J.’s Defense: A Reductio Ad Absurdum of the Economics of Ronald Coase and Richard Posner. European Journal of Law and Economics, Vol. 3, 1996, pp. 265-286. Block, Walter. Private Property Rights, Erroneous Interpretations, Morality and Economics: Reply to Demsetz. Quarterly Journal of Austrian Economics, Vol. 3, No. 1, Spring 2000, pp. 63-78. Barnett, William II and Walter Block. Coase and Bertrand on Lighthouses. Public Choice, Vol. 140, No. 1, July 2009, pp. 1-13. Block, Walter. Transfers in Kind: Why They Can be Efficient and Nonpaternalistic – Comment. International Journal of Value Based Management, 2001, pp. 191-199. Barnett, William II, Walter Block, and Saliba. Perfect Competition A Case of Market-Failure. Corporate Ownership and Control, Summer 2006, Vol. 2, No. 4, pp. 70-75. Barnett, William II and Walter Block. Rothbard on V-Shaped Average and Total Cost Curves. Quarterly Journal of Austrian Economics, Vol. 9, No. 3, Fall 2006, pp. 61-66. Block, Walter. Katrina: Private Enterprise, the Dead Hand of the Past, and Weather Socialism; An Analysis in Economic Geography. Ethics, Place and Environment: A Journal of Philosophy & Geography, Vol. 9, No. 2, 2006, pp. 231-241. Block, Walter. An Economic View of Speculation. 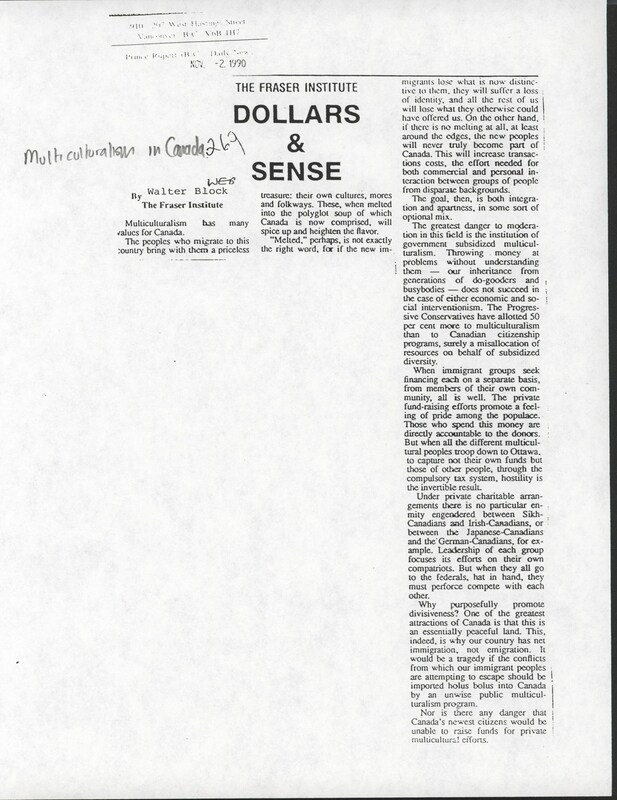 University of British Columbia Business Review, 1983, pp. 9-17. Block, Walter. Professor Modigliani on Price Controls: The Baleful Influence of the Perfectly Competitive Model. International Journal of Social Economics, Vol. 22, No. 5, 1995, pp. 27-30. Block, Walter. The Discounted Marginal Value Product – Marginal Value Product Controversy: A Note. Review of Austrian Economics, Vol. 4, 1990, pp. 199-207. Block, Walter and Michael Walker. Entropy in the Canadian Economics Profession: Sampling Consensus on the Major Issues. Canadian Public Policy, 14, No. 2, June 1988, pp. 137-150. Block, Walter. A Comment on ‘The Extraordinary Claim of Praxeology’ by Professor Gutierrez. Theory and Decision, Vol. 3, No. 4, June 1973, pp. 377-387. Block, Walter. On Robert Nozick’s ‘On Austrian Methodology.’ Inquiry, Vol. 23, No. 4, Fall 1980, pp. 397-444. Block, Walter. A Comment on ‘Towards an Economic Theory of Methodology’ by Professor Gerard Radnitzky. Methodology and Science, Vol. 19, No. 2, 1986, pp. 148-152. Block, Walter. Comment on Leland Yeager on Subjectivism. Review of Austrian Economics, Vol. 2, 1988, pp. 199-208. Block, Walter. Austrian Theorizing, Recalling the Foundations: Reply to Caplan. Quarterly Journal of Austrian Economics, Vol. 2, No. 4, Winter 1999, pp. 21-39. Block, Walter. Realism: Austrian vs. Neoclassical Economics: Reply to Caplan. Quarterly Journal of Austrian Economics, Vol. 6, No. 3, Fall 2003, pp. 63-76. Block, Walter. Rejoinder to Caplan on Bayesian Economics. Journal of Libertarian Studies, Vol. 19, No. 1, Winter 2005, pp. 79-95. Block, Walter, Art Carden and Stephen Carson. Ex Ante and Ex Post: What Does Rod Stewart Really Know Now? Business and Society Review, Vol. 111, No. 4, Winter 2006, pp. 427-440. Block, Walter. Reply to Caplan on Austrian Economic Methodology. Corporate Ownership & Control, Vol. 4, No. 3, November 2007, pp. 312-326. Block, Walter. Rejoinder to Hoppe on Indifference. Quarterly Journal of Austrian Economics, Vol. 12, No. 1, 2009, pp. 52-59. Block, Walter. Is There an Anomalous Section of the Laffer Curve? Libertarian Papers, Vol. 2, 2010. Barnett, William II and Walter Block. On the Use and Misuse of the Laffer Curve. Journal of Public Finance and Public Choice, Vol. 24, No. 3, 2005, pp. 139-152. Block, Walter. Henry Simons is Not a Supporter of Free Enterprise. Journal of Libertarian Studies, Vol. 16, No. 4, Fall 2002, pp. 3-36. Block, Walter. Reply to Frank van Dun’s ‘Natural Law and the Jurisprudence of Freedom.’ Journal of Libertarian Studies, Vol. 18, No. 2, Spring 2004, pp. 65-72. Barnett, William II, Walter Block, and Joseph Salerno. Relationship Between Wealth or Income and Time Preference is Empirical, not Apodictic: Critique of Rothbard and Hoppe. Review of Austrian Economics, 2006. Block, Walter. Fanatical, Not Reasonable: A Short Correspondence Between Walter Block and Milton Friedman (on Friedrich Hayek). Journal of Libertarian Studies, Vol. 20, No. 3, November 2006, pp. 61-80. Block, Walter. Is Milton Friedman a Libertarian? The Independent Review, Spring 2007. Block, Walter, Peter Klein, and Per Henrik Hansen. The Division of Labor under Homogeneity: A Critique of Mises and Rothbard. The American Journal of Economics and Sociology, Vol. 66, No. 2, April 2007, pp. 457-464. Block, Walter, Marcus Epstein, and Thomas E. Woods. Jr.. Chesterton and Belloc: A Critique. The Independent Review, Vol. 11, No. 4, Spring 2007, pp. 579. Block, Walter. Van Dun on Freedom and Property: A Critique. Libertarian Papers, Vol. 2, No. 4, 2010. Block, Walter and Michael Walker. Lexicon of Economic Thought. The Fraser Institute, 1989. Block, Walter. A Comparison of Economic Correctness and Political Correctness. Humanomics, Vol. 20, No. 3-4, 2004, pp. 14-25. Barnett, William II and Walter Block. Scale of Values Violates Singularism. Dialogue, Vol 3, 2009, pp. 81-91. Barnett, William II and Walter Block. Economic Singularism. Research on the History of Economic Thought & Methodology, Vol. 26-A, 2008, pp. 15-30. Barnett, William II and Walter Block. Rejoinder to Critics of Laissez-Faire Capitalism. The Journal of Corporate Citizenship, No. 23, 2006, pp. 17-20. Block, Walter and Jerry R. Goolsby. Education and Bureaucracy: National Testing and School Privatization. Texas Education Review, Winter 2003-2004. Block, Walter and Paul Cwik. Teaching Business Ethics: A Classficationist Approach. A Libertarian Review, April 2007. Block, Walter. Is There a Ph.D. Glut in Economics in Academia? Romanian Economic and Business Review, Vol. 5, No. 1, pp. 9-26; reprinted in Economics Management, and Financial Markets, Vol. 5, NO. 1, 2010. Block, Walter. On Value Freedom in Economics. The American Economist, Vol. 19, Spring 1975, pp.38-41. Block, Walter. Value Freedom, Laissez Faire, Mises and Rothbard: A Comment on Prof. Gunning. American Journal of Economics and Sociology, Vol. 64, No.. 3, July 2003, pp. 919-938. Barnett, William II and Walter Block. A Positive Programme for Laissez-Faire Capitalism. The Journal of Corporate Citizenship, No. 19, Autumn 2005, pp. 31-42. Block, Walter and Erica Kilchrist. Distributive Justice. International Journal of Social Economics, 2006, pp. 102. Block, Walter and Horton Marshall. Was Marx an Adjunct? Texas Education Review, Vol. 1, No. 4, Winter 2002, pp. 43-46. Barnett, William II and Walter Block. Economic Categorization. Laissez-Faire, No. 28-29, March-September 2008, pp. 4-12.